Acknowledged author Kathryn Pinna wrote Nutrition for Health and Healthcare comprising 880 pages back in 2016. Textbook and etextbook are published under ISBN 1305627962 and 9781305627963. 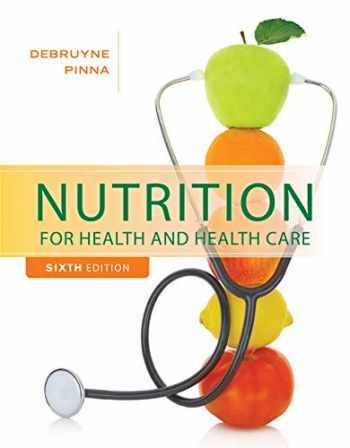 Since then Nutrition for Health and Healthcare textbook received total rating of 3.5 stars and was available to sell back to BooksRun online for the top buyback price of $32.45 or rent at the marketplace. NUTRITION FOR HEALTH AND HEALTH CARE approaches the study of nutrition and diet therapy from the perspective of nursing and health science, including examples and data that can help prepare you for your future career. Learn about basic nutrition concepts, such as metabolism, vitamins, and minerals, and clinical topics organized by organ systems, linking nutrition to different disease states, such as diabetes, renal disease, and liver disorders. Apply what you have learned in Case Studies and Clinical Applications features throughout the text. Use all of the student resources to help you succeed in your course.